1. Amanita sp-M36, el Volcán La Malinche, Tlaxcala edo., México. 2. Amanita sp-M36, el Volcán La Malinche, Tlaxcala edo., México. intro For the time being, please see the technical tab of this page for data accumulating concerning this taxon. discussion At the moment, this species is known only from sites within the La Malinche National Park in the state of Tlaxcala, Mexico. pileus 84 mm wide, pale yellow (slightly more yellow than 3A3) at first, then 3A2, no staining or bruising observed, subhemispheric, then convex and slightly flattened over disc, with decurved margin, waxy, dull; context off-white and pale tannish at the inner end of lamellae and beneath pileipellis, no staining or bruising observed, 9 - 10 mm thick, thinning evenly toward margin; margin sometimes appendiculate with ragged bits of partial veil, striate (0.?R); universal veil as large calyptra nearly covering pileus, whitish, membranous, easily removed. lamellae free with decurrent lines connecting to apical partial veil, ? ?, cream in mass, pale cream to white in side view with pale tannish white along junction with pileus context, 8 - 10 mm thick, broadest at about two-thirds of radius from stipe, partially covered by shreds of partial veil, apparently rather thick; lamellulae truncate to rounded truncate, unevenly distributed, of diverse lengths, plentiful, may arise both at pileus margin and at stipe. 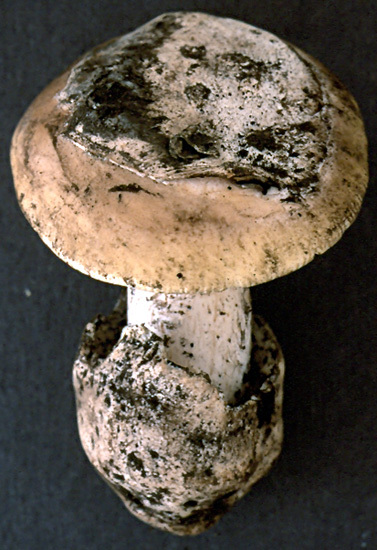 stipe 79 × 21 mm, white, bruising and staining not observed, narrowing upward, not flaring at apex, longitudinally striatulate, somewhat shaggy-floccose below partial veil; context pale yellowish cream, staining and bruising not observed, with 4 mm wide central cylinder stuffed densely with white fibrillose material, with larval tunnels concolorous or slightly brownish; partial veil apical, white, submembranous, shredding, partially remaining on gills and cap margin, striate above, smooth subfloccose below; universal veil as saccate volva attached only at very base of stipe, fleshy, 50 × 38 mm, 7 - 8 mm thick at midpoint of free limb, with exterior and inner surfaces smooth and white, with interior white above junction with stipe base and pale tannish white below that junction, with limbus internus rather small and positioned rather high on the free limb of the volval sac. odor/taste Odor somewhat like fish. Taste very slightly sweet at first, then faintly metallic. tests Spot test for laccase (syringaldazine) - negative. Spot test for tyrosinace (paracresol) - in just maturing specimen, positive rather slowly, first in lower half of stipe and universal veil below stipe base, then becoming stronger in both regions and very strong in pileipellis, finally (after 15 min.) faintly positive in upper part of stipe and pileus context (particularly above stipe) and on exterior surface of volval limb. Test voucher: Tulloss 8-18-98-B. basidiospores ?? ; white in deposit. ecology Solitary. At ?? m elev. In dark, damp, sandy loam over volcanic ash. material examined MÉXICO: TLAXCALA—Mpio. Huamantla - La Cañada Grande, E slope, La Malintzi volcano [19°14’45” N/ 97°54’56” W, 3110 m], 24.vi.1988 Alejandro Kong Luz 615 (RET 127-1; TLXM as "A. affin. calyptrata"), 13.vii.1988 A. Kong Luz 696 (RET 127-2; TLXM as "A. affin. calyptrata"), 11.vii.1990 G. Santiago Martínez 151 (RET 126-10; TLXM as "A. affin. calyptrata"); Parq. Nac. La Malintzi, Altamira de Guadalupe, 11.vi.1985 I. González Fuentes 932 (NY). Mpio. Mariano Arista - 4-5 km E of Nanacamilpa, 25.viii.1989 A. Kong Luz 1251 (RET 126-5; TLXM as "A. calyptratoides"). Mpio. Tlaxco - Cerro El Peñón, 24.vi.1991 G. Santiago Martínez 306 (RET 126-9; TLXM as "A. affin. calyptrata"), 20.viii.1998 David P. Lewis s.n. [RET 8-20-98-A] (RET 293-3). Mpio. Trinidad Sánchez Santos, La Malintzi volcano, Parq. Nac. La Malinche, 4-7 km W of Francisco Javier Mina, 18.viii.1998 A. Kong Luz s.n. [Tulloss 8-18-98-B] (RET 293-4; TLXM). discussion In the field, Tulloss 8-18-98-B was first thought to be A. tuza and later thought to be A. vernicoccora; however it was never worked up microscopically. When J.-M. Moncalvo and S. Sánchez Ramírez reported to me that the cited collection is genetically isolated from material of the macroscopically similar A. vernicoccora, a code name was given to the above cited collection (sp-M36). A number of other collections from La Malinche volcano have also been assigned provisionally to A. sp-M36. 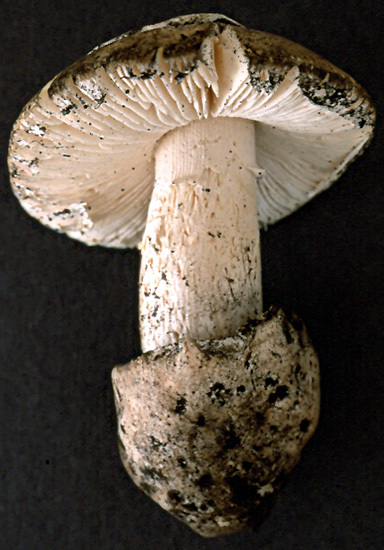 This species appears to be most closely related to the other taxa of Amanita stirps Calyptroderma. 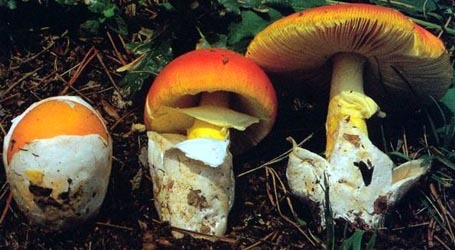 In that stirps, the cap color of the present species is most similar to that of A. vernicoccora. The material described on this taxon page would never have come to RET's attention if it were not for the staff and students at the Autonomous University of Tlaxcala. photo RET - (1-2) el Volcán La Malinche, Tlaxcala edo., México. select a collection to review/add spore measurements..#779268. Alejandro Kong Luz, #615, MÉXICO, : TLAXCALAMpio. Huamantla, La Cañad..#779269. A. Kong Luz, #696, MÉXICO, : TLAXCALAMpio. Huamantla, La Cañada Grand..#779270. G. Santiago Martínez, #151, MÉXICO, : TLAXCALAMpio. Huamantla, La Ca�..#779271. I. González Fuentes, #932, MÉXICO, : TLAXCALAMpio. Huamantla, Parque ..#779272. A. Kong Luz, #1251, MÉXICO, Mpio. Mariano Arista, 4-5 km E of Nanacami..#779273. G. Santiago Martínez, #306, MÉXICO, Mpio. Tlaxco, Cerro El Peñón#779274. David P. Lewis, #s.n.=>RET 8-20-98-A, MÉXICO, Mpio. Tlaxco, Cerro El P..#779275. A. Kong Luz, #s.n.=>Tulloss 8-18-98-B, MÉXICO, Municipio Trinidad Sán..#779276. Alejandro Kong Luz 615 , #s.n., MÉXICO, : TLAXCALAMpio. Huamantla, La..#779277. A. Kong Luz 696 , #s.n., MÉXICO, : TLAXCALAMpio. Huamantla, La Cañad..#779278. G. Santiago Martínez, #151, MÉXICO, : TLAXCALAMpio. Huamantla, La Ca�..#779279. I. González Fuentes, #932, MÉXICO, : TLAXCALAMpio. Huamantla, Parque..#779280. A. Kong Luz, #1251, MÉXICO, Mpio. Mariano Arista, 4-5 km E of Nanacami..#779281. G. Santiago Martínez, #306, MÉXICO, Mpio. Tlaxco, Cerro El Peñón#779282. David P. Lewis, #s.n.=>RET 8-20-98-A, MÉXICO, Mpio. Tlaxco, Cerro El ..#779283. A. Kong Luz, #s.n.=>Tulloss 8-18-98-B, MÉXICO, Municipio Trinidad Sán..#808961. Alejandro Kong Luz 615 , #s.n., MÉXICO, TLAXCALA, Mpio. Huamantla, L..#808962. A. Kong Luz 696 , #s.n., MÉXICO, TLAXCALA, Mpio. Huamantla, La Caña..#808963. G. Santiago Martínez, #151, MÉXICO, TLAXCALA, Mpio. Huamantla, La Ca..#810630. Alejandro Kong Luz 615 , #s.n., MÉXICO, TLAXCALA, Mpio. Huamantla, L..#810631. A. Kong Luz 696 , #s.n., MÉXICO, TLAXCALA, Mpio. Huamantla, La Caña..#810632. G. Santiago Martínez, #151, MÉXICO, TLAXCALA, Mpio. Huamantla, La Ca..#810633. I. González Fuentes, #932, MÉXICO, TLAXCALA, Mpio. Huamantla, Parqu..#810634. A. Kong Luz, #1251, MÉXICO, TLAXCALA, Mpio. Mariano Arista, 4-5 km E o..#810635. G. Santiago Martínez, #306, MÉXICO, TLAXCALA, Mpio. Tlaxco, Cerro El..#810636. David P. Lewis, #s.n.=>RET 8-20-98-A, MÉXICO, TLAXCALA, Mpio. Tlaxco,..#810637. A. Kong Luz, #s.n.=>Tulloss 8-18-98-B, MÉXICO, TLAXCALA, Municipio Tri..